The Formfit® Ankle brace provides stability and protection for the ankle – whether used prophylactically, for chronic instability or following an injury. A hybrid between a rigid ankle stirrup and a soft ankle support, the Formfit Ankle ensures a close fit which limits inversion, eversion, flexion and extension movements. The low profile design fits easily into shoes and the quick lace up feature makes it easy to don and doff. Breathable material ensures it can be comfortably worn all day. 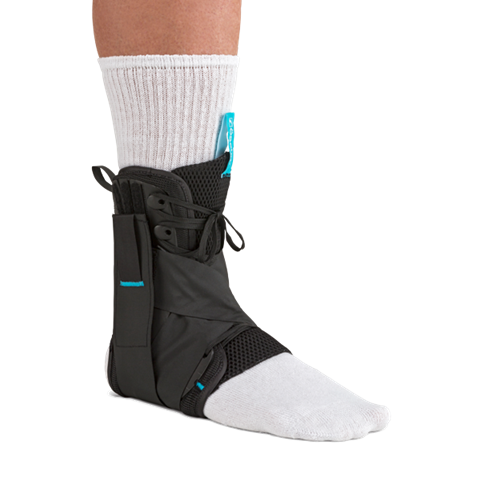 The Formfit Ankle with Figure 8 strap version, offers an even greater level of support, by further limiting the range of motion of the ankle. *Measure Heel to Instep circumference diagonally over the base of the heel and across the ankle bone as shown.